This weekend marked the debut of Guilds of Ravnica Standard at the Grand Prix stage. Earlier on Saturday morning, 1,339 main event competitors arrived in Lille with their best Standard decks. Despite the legality of shock lands and check lands, in the end basic Island and basic Mountain reigned supreme: Etienne Busson emerged triumphant with Mono-Red, defeating Gabriel Nassif and his Mono-Blue deck in the finals. In the Day 1 highlights, I already covered why Golgari Midrange was considered to be the "Deck To Beat" in Standard going into this weekend. Its popularity continued into Day 2, as you can see in the metagame breakdown below. But as I also covered yesterday, there are several ways to beat Golgari Midrange. And given that only two pilots made it through to the Top 8 and none of them advanced to the finals, my take-away from this event is that if you are prepared for it, the deck is definitely beatable. Another take-away, judging by the Top 8 decks and the 9th-37th place decklists, is that Standard remains a voyage of discovery where there is little to no consensus on the best build of every deck in the metagame. For instance, how many planeswalkers or six-drops do you want to play in Golgari Midrange, and which ones? And for Jeskai Control, what is the best mix between cheap answers and expensive win conditions? There was a lot of variety, and the sharpest, optimized builds haven't been found yet. We'll probably have to wait until the Pro Tour for that. On Sunday mornings at GPs, coverage always starts with the segment known as Good Morning Magic. This segment showcases some of the wackiest, spiciest, and weirdest brews to make it through to Day 2. Let's take a closer look at some of the best-performing decks from that segment. The game plan of this deck is to develop your mana early on with Grow from the Ashes and Circuitous Route while keeping the board clear with Deafening Clarion and Star of Extinction. Eventually, you can win the game with heavy-hitters like Pelakka Wurm and March of the Multitudes. In his Round 9 feature match, Bernabe played a marathon Game 1 against Mattia Rizzi. Both players got up to humongous life totals—Rizzi because of Wildgrowth Walker triggers; Bernabe because of an attack with 19 Soldier tokens—and the board states got frankly ridiculous. But eventually, Bernabe finally found a Banefire off the top for the win, accentuating the impact of late-game singletons. The defining combo in this deck is Goblin Chainwhirler plus Status // Statue. If you play the Goblin and respond to its enters-the-battlefield ability by giving it deathtouch, it will sweep all creatures on the opponent's side of the board. Given that Stomping Ground and Blood Crypt are not Standard legal, the mana base isn't pretty, but it works. We had some discussions within the coverage team how to name the deck, but since the majority of the creatures in the deck were Goblins, including a tribal payoff in Siege-Gang Commander, we settled on "Jund Goblins." Sadly, during Woll's Round 9 feature match, no actual Goblins showed up, leading to a rather confused Twitch chat. Some viewers even started to wonder if Carnage Tyrant was actually just 413 Goblins in a Dinosaur suit. Sadly, the answer to that is no. The final three decks that I'd like to feature from the Good Morning Magic rounds were all shown on camera in Round 10, and all finished with a 10-5 record—not amazing, but it indicates that a variety of strategies can compete in Standard. White Weenie is a strategy as old as Magic, as players were already attacking with Savannah Lions in 1993. Although Crusade hasn't been Standard legal for quite a while, the latest incarnation of the strategy relies on Benalish Marshal and Venerated Loxodon to boost its creatures instead. This deck exploits Sarkhan, Fireblood and Spit Flame with eight Dragons. Between Sarkhan and Wily Goblin, the deck is actually capable of kicking Verix Bladewing as early as turn four. The standout card in this list is Disinformation Campaign. With Sinister Sabotage, Discovery // Dispersal, and Thought Erasure, the enchantment can be bought back for repeated value. And when you've committed to the Grixis shard anyway, you might as well add Nicol Bolas, the Ravager. There is always more to a Grand Prix than just the main event and the pro players. The community has made them about fun Magic gaming in all its forms: side events, artist booths, cosplay, and so on. In recognition of this, the whole experience will be called MagicFest next year. 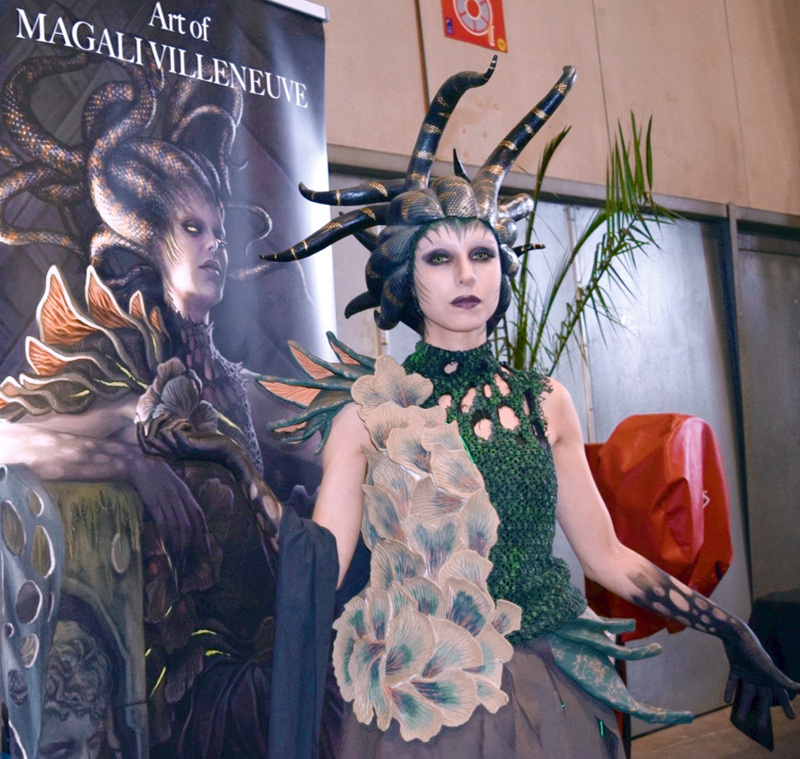 This weekend, we saw a huge interest for the artist booths of Magali Villeneuve and Michael Bierek, bustling side events, and various amazing cosplays by Manju. I was particularly impressed by how Vraska's queenly presence graced Magali Villeneuve’s artist booth. In his first Grand Prix since his victory at the 2018 World Championship, Javier Dominguez was among the first players to lock up a Top 8 berth. Playing a Golgari Midrange deck featuring 3 Carnage Tyrant and 3 Find // Finality, which he combined to great effect throughout the tournament, he had a great start to the 2018-2019 season. Although he fell to eventual winner Etienne Busson in the semifinals, his strong performance underlined that he's the World Champion for a reason. Interestingly, Dominguez did a large part of his Standard preparation on Magic Arena. Although he also played quite a bit on Magic Online, he told me yesterday that he had been enjoying the new program much more than he expected: "Arena lets me to prepare for a tournament and have a video game experience [at the same time]." 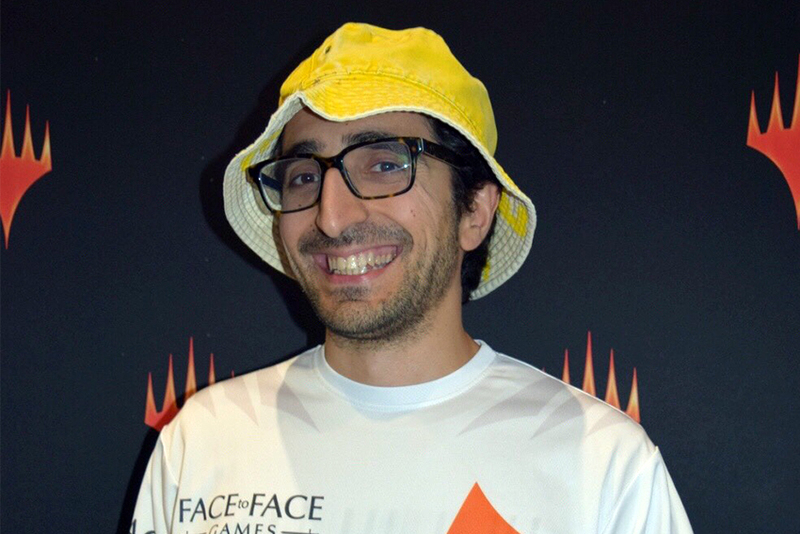 Despite being one of the game's all-time greats with 9 Pro Tour Top 8s to his name, Hall of Famer Gabriel Nassif hadn't made a Grand Prix Top 8 in a while. His last one was nine years ago. But in the week leading up to Grand Prix Lille, he dedicated himself and tested a variety of decks on his Twitch stream. He shared his favorites in his ChannelFireball article last Thursday, out of which he eventually chose Mono Blue. 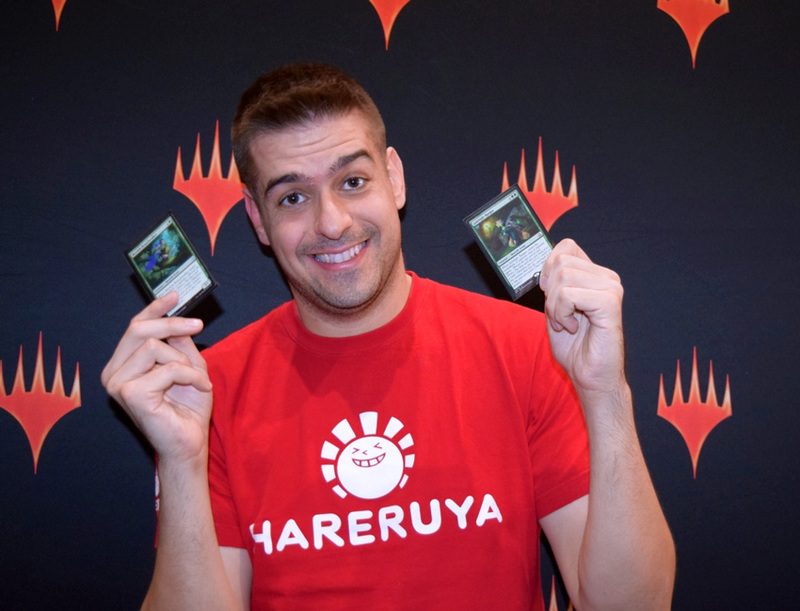 Before the Grand Prix started, Nassif tweeted that he had "four copies of the best card in Standard" in his main deck. If you had been watching him, then you could have correctly guessed that he was referring to Dive Down. “The card is so good. You kill a Lyra Dawnbringer with Tempest Djinn, you save your guy from Deafening Clarion, from Find // Finality—it does it all," Nassif told me. He ran four copies of the instant in his Mono-Blue Tempo deck, although he admitted that Curious Obsession might actually be the best card in that particular deck. He picked up the deck after he kept losing to it, found that it had a good matchup against Golgari Midrange, and soared to the Top 8. In a finals between basic Island and basic Mountain, Etienne Busson emerged triumphant. 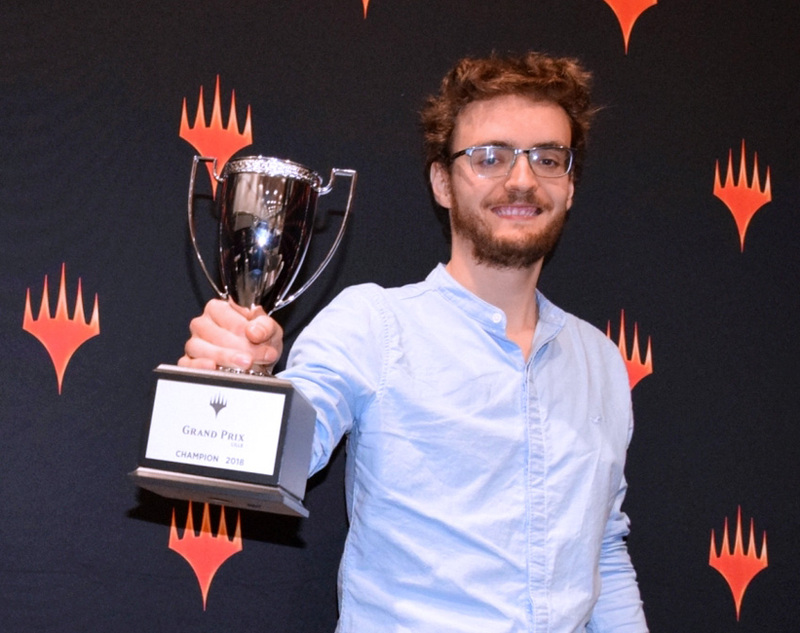 The 25-year-old Magic streamer and aspiring pro from Switzerland, in his second Grand Prix Top 8, took the trophy with Mono-Red. "The main reason I played this deck is that I felt I had a pretty good matchup against black-green, weirdly enough, and I expected a lot of black-green," he said after his victory. His assessment was partly based on his sideboard, which allowed him to play control and go bigger post-board with Treasure Map and additional removal spells. In his Top 8 match against Golgari Midrange, I watched him bring in nearly his entire board, cutting several Wizards and Wizard's Lightning to transform into essentially a control deck. The defining card of his deck, both before and after sideboarding, was Experimental Frenzy. In his semifinals against Javier Dominguez, the enchantment allowed him to play as many as five extra cards per turn, which quickly snowballed into an insurmountable advantage. "Frenzy is just amazing," Busson said. "I'm not really an aggro player—I'd rather play midrange or control—and the only reason I'm playing this deck is because of Frenzy. Because it's so fun and so good. I really don't think I would be playing Mono-Red otherwise." Congratulations to Etienne Busson, your Grand Prix Lille 2018 champion!